Glycine is a major amino acid in mammals and other animals. It is synthesized from serine, threonine, choline, and hydroxyproline via inter-organ metabolism involving primarily the liver and kidneys. Under normal feeding conditions, glycine is not adequately synthesized in birds or in other animals, particularly in a diseased state. Glycine degradation occurs through three pathways: the glycine cleavage system (GCS), serine hydroxymethyltransferase, and conversion to glyoxylate by peroxisomal d-amino acid oxidase. Among these pathways, GCS is the major enzyme to initiate glycine degradation to form ammonia and CO2 in animals. In addition, glycine is utilized for the biosynthesis of glutathione, heme, creatine, nucleic acids, and uric acid. Furthermore, glycine is a significant component of bile acids secreted into the lumen of the small intestine that is necessary for the digestion of dietary fat and the absorption of long-chain fatty acids. Glycine plays an important role in metabolic regulation, anti-oxidative reactions, and neurological function. Thus, this nutrient has been used to: (1) prevent tissue injury; (2) enhance anti-oxidative capacity; (3) promote protein synthesis and wound healing; (4) improve immunity; and (5) treat metabolic disorders in obesity, diabetes, cardiovascular disease, ischemia-reperfusion injuries, cancers, and various inflammatory diseases. 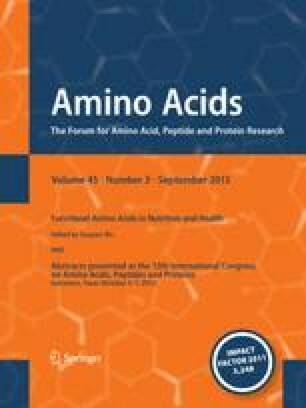 These multiple beneficial effects of glycine, coupled with its insufficient de novo synthesis, support the notion that it is a conditionally essential and also a functional amino acid for mammals (including pigs and humans). Work in our laboratories was supported by the National Basic Research Program of China (Grant 2013CB127302), National Research Initiative Competitive Grants from the Animal Reproduction Program (2008-35203-19120) and Animal Growth & Nutrient Utilization Program (2008-35206-18764) of the USDA National Institute of Food and Agriculture, AHA (10GRNT4480020), Texas A&M AgriLife Research (H-8200), the National Natural Science Foundation of China (No. u0731001, 30810103902, 30928018, 30972156, 31172217 and 31272450), China Postdoctoral Science Foundation (2012T50163), Chinese Universities Scientific Funds (No. 2012RC024), and the Thousand-People Talent program at China Agricultural University. Important contributions of our graduate students and colleagues to the recent development of the field are gratefully appreciated.